Welcome to the World Max! This morning, Thursday, November 16 at 7:15 Max was born. After 17 hours of intensive labor, Karen doing the hard work and Matthias providing the mental support, Maximilian August Zeller is finally here! Just after 4:00am Karen was fully diluted and the last and hardest part of the journey would begin, the pushing. Karen did great and I think the muscles she build up during horseback riding paid off. Contraction after contraction and push after push Max slowly became visible. Here is the first family picture! And here the first picture of Max with open eyes. Both mother and child are exhausted but doing fine. 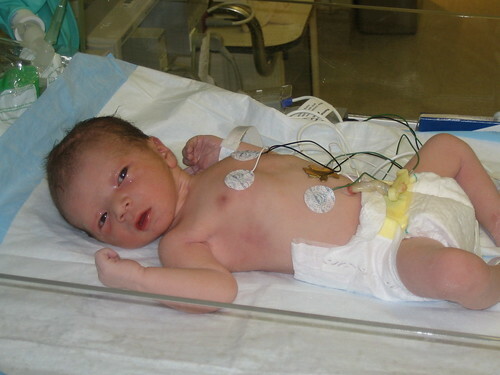 Max weights 6 pounds and 4 ounces (2,83 KG) and is 20 inches (50 cm) long. It is 3:00am in the night and Karen is making good progress. Right now she is 7 cm dilated only 2 cm more to go before she is ready to deliver. The contractions started really to pick up around 3:00pm and the nurse provided some medication which numbed it so that Karen could get some rest. At that point in time Karen was about 2 cm dilated. Around 6:00pm I sneaked out and had a brief dinner at The Counter (excellent burgers, need to come here with Max when he can eat them). It was weird sitting among all those people and knowing that I would be father in the next 24 hours. In the meantime the doctor recommended Karen to break the water manually to accelerate the labor. So after I came back from dinner the contractions had become significantly stronger and very painful so we decided it is time for the epidural. It was around 8:00 pm and Karen was about 4 cm dilated. The hospital staff was great and they administered the epidural in the next 30 minutes. One word of warning: After you have an epidural you cannot walk around anymore and you are also very limited to the birthing positions. In the birthing class we attended they provided really misleading information and showed videos of woman who would walk around after the epidural. In the hospital they told us that’s really rare and not advised. Anyhow the epidural helped Karen to relax and takes the pain away. Doctors and nurses come in the room every 20 minutes so it does not get boring, but it is hard to get sleep. The doctor just came back and told us Karen is now 8 cm dilated. Yeah! Need to get a little bit more sleep. Max will be born very soon! A lot has happened today and I am sitting in the hospital with Karen as I write this. But lets start at the beginning. When Karen woke up this morning around 10:00 am she noticed that she had lost some blood. So she called the hospital and they asked her to come in right away. Meanwhile I was down in San Jose at work. When Karen called me on the way to the hospital I got very concerned, but she was calm so that calmed me down and she told me just to continue to work. An hour later Karen called and told me that the doctor advised to induce labor with Pitocin. That meant we were getting ready for prime time. 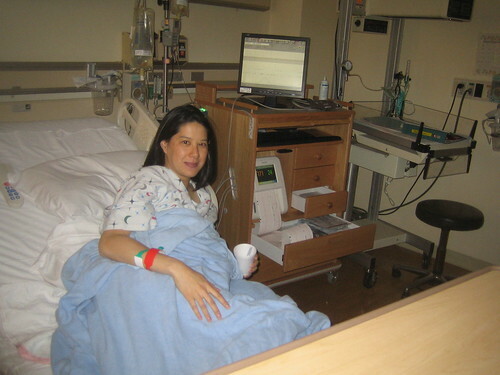 Once you induce labor there is no turning back and they asked Karen to stay in the hospital. So I activated my email out-of-office notice (I plan to take off until the end of the year), cleaned my desk and drove home to pick up a suitcase with some essential clothing and supplies. Then I drove over to the Lucile Packard Children Hospital on the Stanford University campus to meet Karen. When I arrived Karen was already settled in her hospital room and hooked up to various devices to measure Max’s heartbeat and contractions. She felt OK and the contraction pain was not bad. She can even smile on the picture. I have not posted for a while. We have been busy preparing for Max and I was also travelling on business, the last trip to the Adobe Max conference… But now things have become serious. Karen started to have contractions a couple of days ago and today they have become stronger and more frequent. So far they are painless, but you can feel all stomach muscles harden during the contraction. I suspect these are still Braxton Hicks contractions. We are ready for Max. We got the base for the baby carrier installed in both cars. The baby room is ready. We have diapers, clothing and even some toys. The other day I bought a Baby Bjorn Active Carrier. I am very excited to use it! Today we decided to start working on the baby room. Well until today it was the guest room with a queen size bed. I got a U-Haul van and we transported the bed to our parents-in-law in Alameda. In return they gave us a single bed which we took back to Palo Alto. In the evening we started to assemble the crib Karen had bought on Craigslist a couple of weeks ago. A really nice wooden Italian Paly crib which we bought for the super bargain price $125 including mattress. It came from a very friendly family in Los Altos who had just moved here from Australia and their baby had outgrown the crib. The setup was more difficult then we thought (as usual) but after some back and forth we got it assembled. 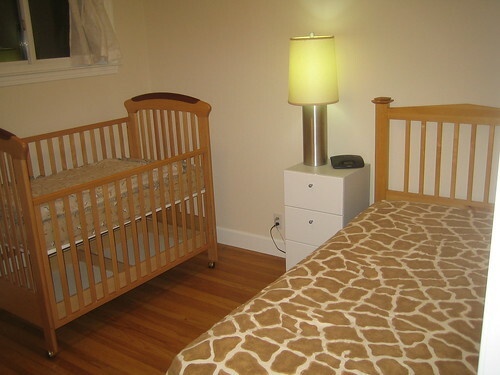 We also assembled the twin bed and put the changing table into the room. It looks already cute and the next step will be painting the room. I also have some special ideas for decorating the walls. 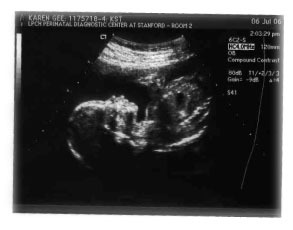 Today I scanned the ultrasound pictures of Max which we did on July 6. By now he is larger then the actual picture. You can also make out features of the face. Karen claims he has my nose and her head shape. This week Karen felt Max moving for the first time. Apparently he was very active. I was on a business trip in Ottawa and did not have a chance yet to feel his movements. I am looking forward to it. 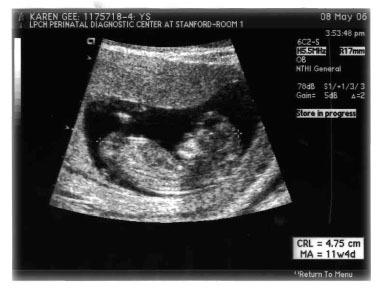 Here is the first ultrasound image of Max. It was taken on May 8, 2006 and at that point Karen was just over 3 months pregnant. You are currently browsing the archives for the Before Birth category.